Puppy acne is a deep-seated skin infection that usually affects young pups 3 months of age and older. Certain breeds, such as the Doberman Pinschers, Boxers, Bulldogs, are more prone to acne. This page looks at the symptoms, causes, and treatment of canine acne. Just like human teenagers, young puppies 3 months of age and older can get acne. You can tell if your puppy has acne by identifying red-purplish pustules and blackheads (comedones) that come to a head and drain pus. Acne are usually found on the chin and lower lip areas, sometimes on the belly, and occasionally in the genital and groin areas. Canine acne is not especially common. Certain breeds are more susceptible to this skin condition. They include the Doberman Pinschers, Golden Retrievers, Boxers, Great Danes, and Bulldogs. Acne by itself usually does not bother the puppy too much, but sometimes there is secondary infection which can cause pain and itchiness to the puppy. In some cases, hair loss in the affected area and loss of pigmentation may occur. This skin condition usually resolves spontaneously when the puppy reaches sexual maturity. Most cases of acne on puppies and dogs are caused by blockage of hair follicles by skin scales and sebum. Hormonal changes in puppies associated with puberty. A weakened immune system. Puppies with a strong immune system usually do not have skin issues. To prevent acne on your puppy, it makes sense to keep your puppy’s immune system strong. 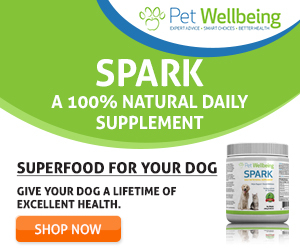 This can be achieved by feeding the puppy a natural healthy diet and having regular exercise. Stress can also cause acne in puppies. To reduce stress, maintain a regular daily routine, avoid sudden changes in the puppy’s environment, train and socialize the puppy so that he is comfortable with other dogs and people. Allergies such as atopic dermatitis can cause skin irritations and inflammation, resulting in breakouts like acne. Also, allergies cause intense itching which can result in excessive scratching. This can also cause skin inflammation and acne-like lesions. Poor grooming and hygiene can understandably cause skin infections such as acne. Puppies with long facial hair are more susceptible to this problem. Keep your puppy clean by brushing her daily and giving her a bath on a regular basis. Conventional treatment of canine acne is the use of benzoyl peroxide shampoo to bath the puppy (twice weekly for 2-3 weeks). This can help remove dead skin and sebum in and around the hair follicles, and also help prevent bacterial infection. Benzoyl peroxide is antibacterial and can clear the hair follicles from germs. A topical gel that contains 5% benzoyl peroxide may also be prescribed for daily use on affected areas. The downside of using benzoyl peroxide for an extended period of time is that it cause excessive drying of the skin and subsequent irritation. In addition to benzoyl peroxide, your vet may also prescribe topical antibiotics (such as mupirocin) to prevent or limit secondary infection, and topical steroids (e.g. betamethasone) to decrease the swelling and the inflammation in the area. If your puppy’s acne is not too serious, I would suggest not using any medical shampoo that is rather harsh on the puppy’s skin. Try using some milder products first. 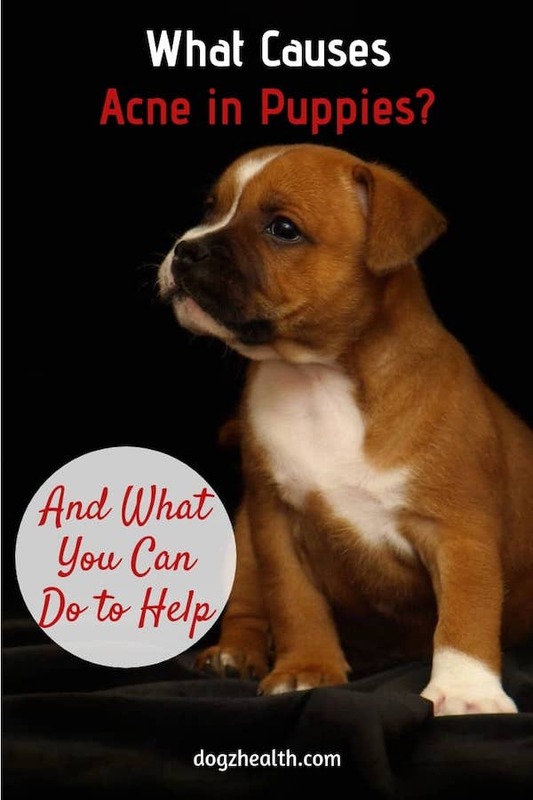 Wash your puppy’s chin daily with warm water and a mild, non-fragranced antibacterial soap. Natural soap that contains oat, such as Earthbath All Natural Shampoo Oatmeal and Aloe is also recommended. You can also use Epson salts to clean the area after washing the chin with soap. Alternatively, try using this organic witch hazel with aloe gel to wipe your puppy’s face after washing. Both witch hazel and aloe vera are antiseptic. Witch hazel is astringent and aloe gel is skin soothing and healing. It is also a good habit to clean your puppy’s chin and mouth after each meal. Apply a warm compress to the affected area to help unblock plugged up pores. Simply use a warm washcloth and hold it to your puppy’s chin for a few of minutes until the cloth is cool. Avoid using plastic bowls because it is easier for bacteria and other germs to grow and that could trigger an acne outbreak. Some pets may also be allergic to the chemicals in the plastic. Use bowls that are made of ceramic or stainless steel instead. As tempting as it may be, do not try to squeeze and pop your puppy’s pimples since this increases the likelihood of bacterial infection and possibly scarring.